The String Quilt is Complete! I'm so excited to share these photos of my first string quilt. And maybe last. LOL No, I won't say I'll never make another string quilt, but it was a labor of love. I used a selection of Anna Maria Horner's Good Folks line and am already plotting another purchase of her fabulous fabrics. 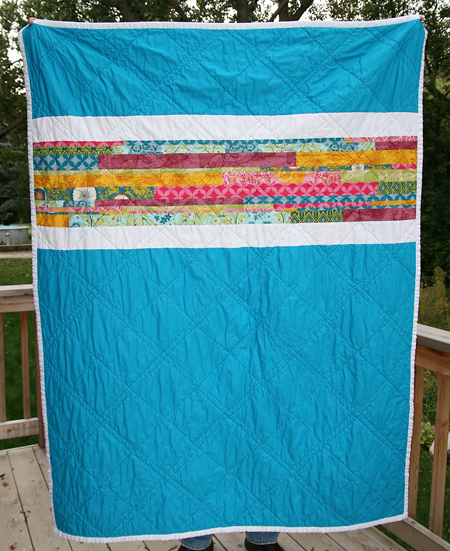 I used left over fabric strips for the back, along with Bella Solids white and my first Kona Solid purchase - turquoise. Such a great punch of color and I loved the quality of the fabric, I'll definitely be using Kona Solids again. 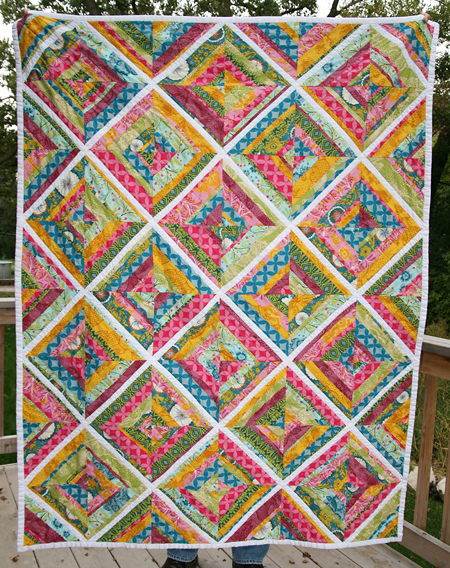 Just as a refresher, I used the string quilt tutorial from Ashely of Film in the Fridge. I created 48, 9.5" blocks. 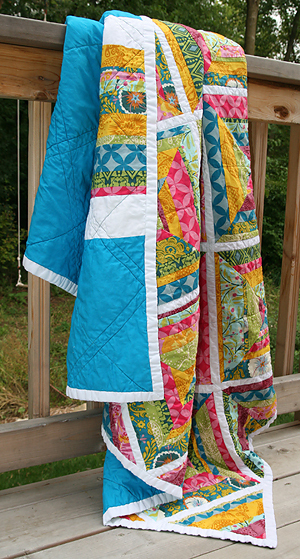 I quilted diagonally - down both sides of the white fabric and then also one diagonal line through each block. I'm still not totally pleased with the straightness of my lines (which is why I tend to quilt free motion). Does anyone have any tips on getting those perfect straight lines? I think my straight-quilting-line idol is Red Pepper Quilts. In any case, it isn't perfect, but it's perfectly mine and I can't wait to use it. The final quilt measures 54" x 72", making it my largest quilt yet. ETA: Thanks for helping my photo make Flickr Explore for September 24th, 2009! Ikea Fabric - Who Knew? !